Comedian Peter Helliar's first ever kids book! Twelve-year-old Frankie Fish hates visiting his grandparents. Grandad Fish is cranky, and yells a lot, and has a creepy hook for a hand – plus he NEVER lets Frankie go inside his shed. 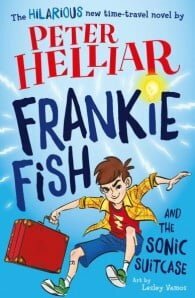 But after a teensy tiny prank goes wrong at school, Frankie is packed off to Old-People Jail for the whole holidays. As the last Fish men standing, Frankie and Granddad must race back in time to undo this terrible mistake. But can they stand each other long enough to put the past back together again? And even if they manage the impossible – will Grandad’s wonky time-machine ever get them home?